Mr. Ku Bon-Hong is being picketed by a group of YTN journalists on his way to work in Seoul, Korea. The journalists are trying to defend their editorial independence from the political influence. South Korea's "Media Today" reported on Nov. 12, 2008 that international media watch group World Association of Press Council (WAPC) raised its voice for the freedom of the press in South Korea in its statement. The newspaper, which reviews and critiques media affairs, expressed its concern for editorial independence and journalistic integrity over the recent appointment of Mr. Ku Bon-Hong as YTN head. 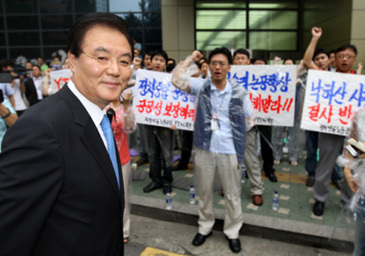 Ku worked as President Lee Myung-Bak's special press aide in Lee's presidential campaign last year. In YTN shareholders' meeting held four months ago Mr. Ku, President Lee's former campaign aide, was appointed to position of the president of South Korea's 24-hour news channel, incurring strong opposition and resistance from the journalists of YTN. Nearly all the YTN journalists, who are members of the labor union, have been in a battle with the YTN management in their efforts to stop Mr. Ku from coming to his office. They argue that Ku's appointment can seriously jeopardize the press freedom, editorial independence in particular. The battle went from bad to worse when Mr. Ku laid off six hard-core protesters recently. South Korean journalists and media related groups are increasingly worried about President Lee Myung-Bak's attemplt to control the nation's news media as more of Lee's former campaign aides are being appointed to the "powerful" positions of news media companies or other media related organizations. The media watch group is particularly worried about President Lee's attempt to control the news media in South Korea. The group urged that Mr. Ku's appointment should be rescinded. The following is the WAPC's full text of the recent situation of South Korean media. YTN is a 24-hour cable TV news channel, headquartered in Seoul South Korea. Founded 15 years ago, it has grown to become a major media company in this short time. 60% of its stock is held by the Korean government. Since July of this year, YTN journalists have raised serious questions concerning the appointment of Mr. Ku Bong-Hong, former aide to President Lee Myung-Bak, as the new head of YTN. Central to these concerns is the editorial independence of the media. The WAPC agrees that the appointment of Mr. Ku, who has a close association with President Lee, raises the specter of government control. We note that even the appearance of bias in this regard serves to destroy the public trust in news media. With all due respect to Mr. Ku, we urge that his appointment be rescinded, and that a new appointee be found that will guarantee editorial independence, and restore public confidence in YTN. The WAPC is an international association of press and media councils from: Azerbaijan, Bangladesh, India, Kenya, Malawi, Nepal, Northern Cyprus, Swaziland, Tanzania, Turkey, Uganda, USA, Zambia, and Zimbabwe. The WAPC is dedicated to promoting high standards of journalistic ethics and the basic right of all persons to communicate freely. Article 19 of the Universal Declaration of Human Rights: Everyone has the right to freedom of opinion and expression; this right includes freedom to hold opinions without interference and to seek, receive and impart information and ideas through any media and regardless of frontiers.